The network undertook another major rebranding effort in 2006 overseen by Mark Wright and London agency Kemistry. The ticker was replaced by a flipper, on-screen graphics were more unified and from October 2007 until August 2008, new studios were progressively rolled out. 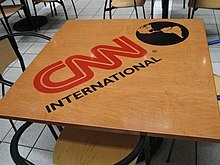 However, on January 1, 2009, CNN International adopted the "lower-thirds" that CNN/US had introduced a month earlier which were inspired by the clean modern design of the CNNI rebrand efforts. "This is CNN" represents CNN International's rebrand with new sets and output in full 16:9 high definition. The "This is CNN" slogan is also used on its sister network CNN in USA. The current managing director of CNN International is Tony Maddox. Although dramatically scaled down since its early days, CNNI currently (as of mid 2017) draws from the feed of the main CNN channel for all editions of The Lead with Jake Tapper, Anderson Cooper 360°, Cuomo Primetime, the first hour of weeknight editions of CNN Tonight, the first hour of weekday editions of New Day, the Saturday edition of Smerconish, the Sunday edition of Inside Politics, State of the Union, Fareed Zakaria GPS, Reliable Sources and some CNN Special Investigations Unit documentaries. The ticker and timepiece of CNN/US are replaced by those of CNNI, although CNN/US's red logo on a white field is retained in the on-screen graphic (rather than replaced by CNNI's white logo on a red field), signifying CNN/US as the originating source. On January 17, 2011, CNN/U.S. dropped its early morning rebroadcasts of ParkerSpitzer and Anderson Cooper 360° during the 4–6 a.m. ET time period, and began to simulcast World Business Today and World One from CNNI in those slots. Both newscasts are the only programs broadcast entirely in 4:3 fullscreen frames on CNN/U.S.' standard-definition and high-definition feeds (the SD feed of CNN/US switched to a widescreen letterbox screen format on January 11, 2011). World One was dropped from CNN/U.S. just a few months later to allow the addition of an extra hour of American Morning which has been replaced with Early Start. CNN International HD is the high definition simulcast feed of the channel broadcasting at 1920x1080i, which was launched in September 2012. Prior to June 3, 2013, only programming from CNN US were available natively in HD, while shows made for CNN International were produced in 4:3 576i. In February 2013, the European SD feed of CNN International began broadcasting in widescreen by downscaling the HD feed, which resulted in all 4:3-native programming being broadcast in pillarbox until the June 3 switchover, finalising on June 17 of the same year, when the switchover was completed. On June 28, 2016, CNN International HD was launched for Sky customers in the UK, on channel 506 or 579, making the next news channel launch in the 600's, as it is next to the GOD Channel. ^ "NSS 7 (20.0°W) Transponder 24 – KingOfSat". kingodsat.net. Retrieved June 3, 2013. ^ "CNN International - National Constitution Center". National Constitution Center – constitutioncenter.org. ^ "CNN International | Idents". TVARK. Archived from the original on March 4, 2016. Retrieved August 7, 2016. ^ Vause, John (April 9, 2008). "San Francisco Torch Relay Broadcast". CNN. ^ "CNN International Now Available on CNNgo". TVNewser. Retrieved July 2, 2015. ^ Home+ (September 1, 2015). "Breaking News, Latest News and Videos - CNN.com". Edition.cnn.com. Retrieved August 7, 2016. ^ "John Vause, Isha Sesay To Anchor CNN International Show From Los Angeles". TVNewser. Retrieved December 9, 2015. ^ "CNN.com Live". Edition.cnn.com. Retrieved August 7, 2016. ^ "CNN Web site targeted - CNN.com". Edition.cnn.com. April 18, 2008. Retrieved August 7, 2016. ^ "CNN Community". Edition.cnn.com. Retrieved August 7, 2016. ^ "CNN Syndication Services". www.cnn.com. ^ "Jerrold Kessel, former CNN correspondent, dies at 66". Variety. February 24, 2011. Retrieved February 26, 2011. ^ Brian (May 29, 2007). "Jeff Koinange No Longer Employed By CNN | TVNewser". Mediabistro.com. Retrieved August 7, 2016. ^ Oliver Burkeman; Peter Beaumont. "CNN chief accuses Israel of terror | Media". The Guardian. Retrieved August 7, 2016. ^ Johnson, Alan (November 20, 2014). "Blaming Israel for Palestinian violence is racist: it denies that Arabs are moral agents". The Telegraph. Retrieved November 21, 2014. ^ CNN apologizes for bias, Hollywoodreporter.com; accessed November 21, 2014. ^ "CNN Describes Muslim Terror Attack on Synagogue as Israel Killing Palestinians". Frontpage Mag. November 18, 2014. Retrieved August 7, 2016. ^ "About Us". CNN. Retrieved February 20, 2010. ^ "CNN tops European news channels according to EMS – Brand Republic News". Brand Republic. Retrieved February 20, 2010. ^ "四月网_M4.CN_全球视野,中国情怀". M4.cn. June 1, 2015. Retrieved August 7, 2016. ^ Gold, Matea (July 7, 2010). "CNN Mideast Affairs editor loses post after tweeting her respect for militant cleric". Los Angeles Times. ^ "Ex-CNN Reporter: I Received Orders to Manipulate News to Demonize Syria and Iran". Archived from the original on April 2, 2013. Retrieved March 4, 2012. ^ "An Interview With Alex Jones, America's Leading (and Proudest) Conspiracy Theorist". Nymag.com. November 17, 2013. Retrieved August 7, 2016. ^ Glenn Greenwald. "Why didn't CNN's international arm air its own documentary on Bahrain's Arab Spring repression? | Glenn Greenwald | US news". The Guardian. Retrieved August 7, 2016. ^ "CNN International's Response to the Guardian – Update". CNN. September 5, 2012.